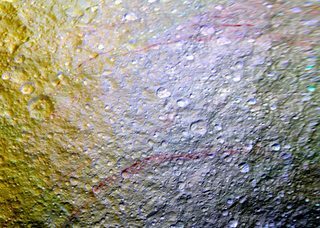 New Cassini’ enhanced-color photos reveal a surprising feature on Saturn’s icy moon Tethys: a mysterious, graffiti-like reddish streaks running for miles on moon’ surface, their origin unknown. Tethys is Saturn’s 5th largest moon — there are 62 known satellites of Saturn — and 16th largest moon in the solar system. It orbits beyond the tenuous E ring. About 660-mile (1062 km) across, Tethys is a small world, though larger than the dwarf planet Ceres. Astronomers thinks its made of water ice with just a small fraction of rock — water ice is the dominant surface material. Now, Tethys become even more intriguing as astronomers are baffled about these huge red scars on moon’ surface, having no idea what they are or where they came from. The new images were captured by NASA’ Cassini spacecraft on May 9, when it was about 300,000 km (186,000 miles) from Tethys and released on July 27. They were taken by using clear, green, infrared, IR and UV spectral filters. The image’s resolution is about 1.1 miles (1.8 km) per pixel. 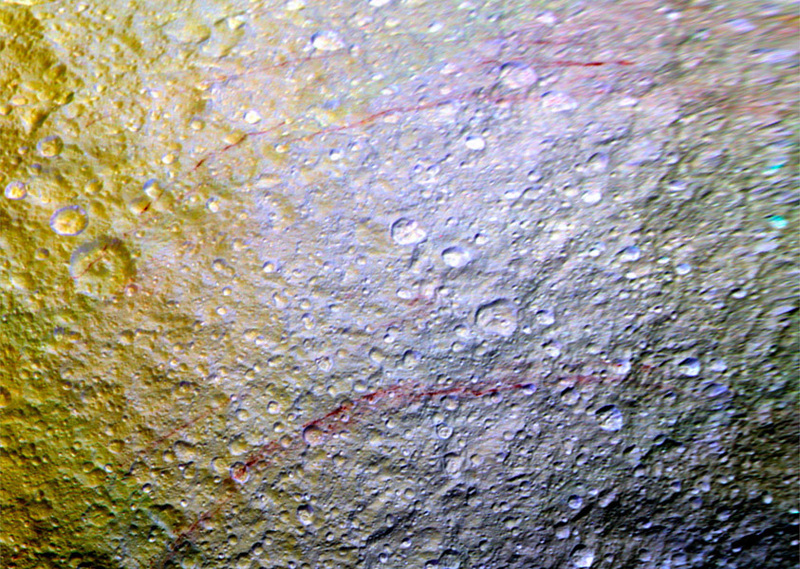 NASA officials said these arc-shaped lines are among the most unusual colour features to be revealed by Cassini on Tethys’ surface. So what are these strange red lines? according to Cassini’ scientists, the origin of these features and their reddish color remains a mystery. Whatever the cause, the team thinks the lines are relatively young. If the stain is only a thin, colored veneer on the icy soil, exposure to the space environment at Tethys’ surface might erase them on relatively short time scales. Cassini scientists plan to perform follow-up observations of the features at higher resolution when the spacecraft encounters Tethys again later this year. We are planning an even closer look at one of the Tethys red arcs in November to see if we can tease out the source and composition of these unusual markings.